Try a smoky and tangy BBQ Bacon-Habanero Burger! 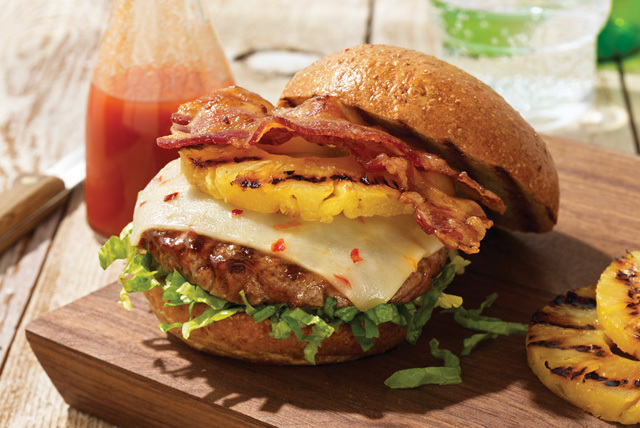 With pineapple rings, habanero cheese and bacon, our habanero burgers are deliciously sweet and spicy. Shape ground beef into 4 (1/2-inch-thick) patties. Grill 5 to 6 min. on each side or until medium doneness (160°F), brushing with barbecue sauce for the last few minutes. Top burgers with cheese; grill 1 min. or until melted. Meanwhile, add pineapple rings and buns, cut sides down, to grill; cook 1 to 2 min. or until buns are lightly toasted. Remove buns from grill. Turn pineapple; grill an additional 1 to 2 min. or until heated through. Fill buns with cheeseburgers, pineapple, bacon and lettuce. For added color and texture, serve with cut-up fresh vegetables and a piece of your favorite fresh fruit to round out the meal. Prepare using BULL'S-EYE Original Barbecue Sauce and/or thin fresh pineapple rings.